I am in love with Pinterest. There is an endless sea of possible DIY projects out there and I have a running list of ones I would love to do. One project that I pinned years ago, while still living in Florida was a faux marble countertop project. Before we had our countertops replaced, I was constantly looking for a way to change the turquoise color to something more appealing. 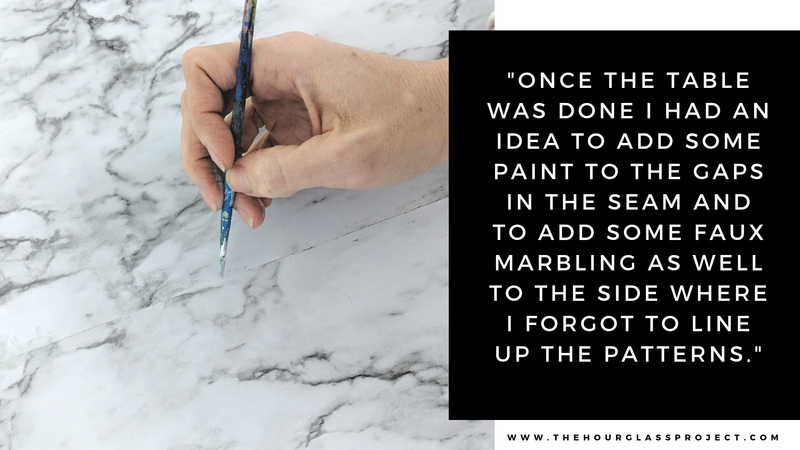 I had seen ways to paint your countertops as well as a technique using contact paper. 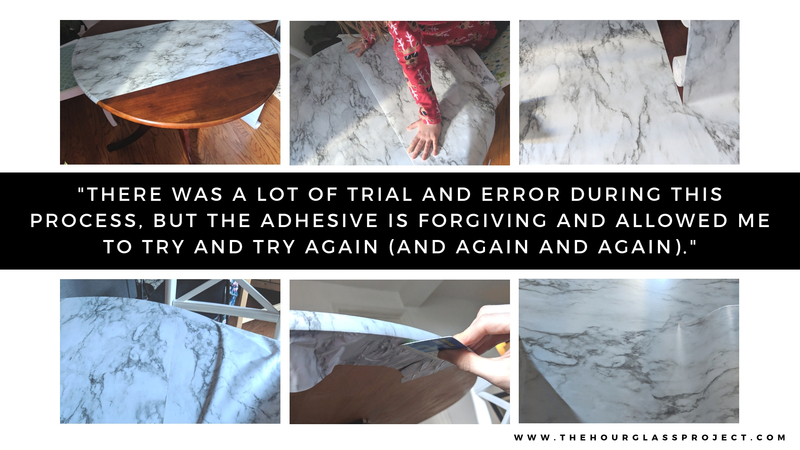 I never followed through because my husband and I decided to replace the countertops instead – of course as soon as they were done we were transferred to DC! LOL. Last month while finishing up some Christmas shopping I saw a roll of the faux marble contact paper at Walmart for around $6. Although I did not have a specific project in mind, I decided to grab it because it was a good price and I knew there would always be a way I could use it. Fast forward about a month – I have been working really hard on finally settling us into our home. We’ve been here for 6 months now and I feel like I have a better understanding of our movements and habits within the home and have been trying to organize and declutter in such a way to help the intentionality of our behaviors. In the process I’ve also been re-decorating to some degree – moving pictures around, adding area rugs, buying house plants and changing around furniture. I figured our coffee tables could use an upgrade as they are just the basic black metal and glass Vittsjo nesting tables from Ikea. 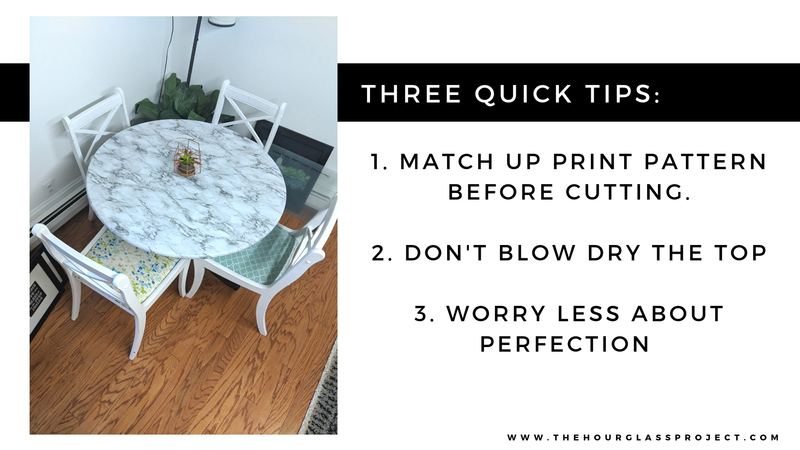 I had seen on Pinterest many hacks where people have painted them and added the marble contact paper. But as I got ready for the project and was scanning the room, I became concerned that the white of the marble would look unbalanced with our new cream area rug. I glanced at our dining table, which I had bought used off Craigslist (with chairs) for $80 in the fall. 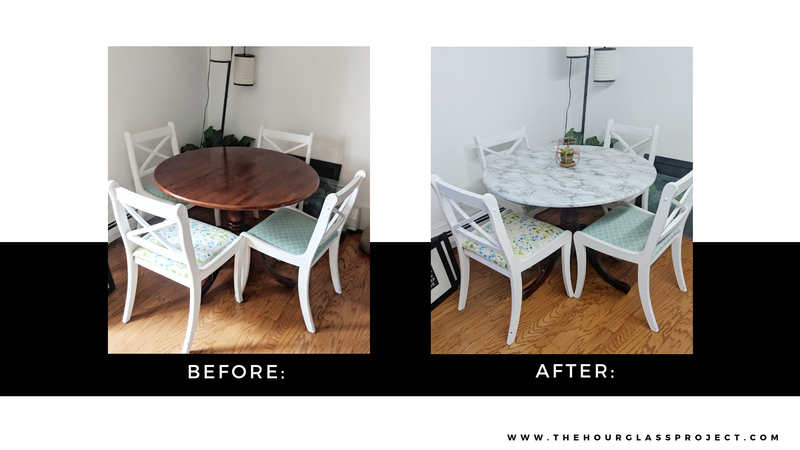 I had already painted and reupholstered the chairs, but I left the table in its original state. 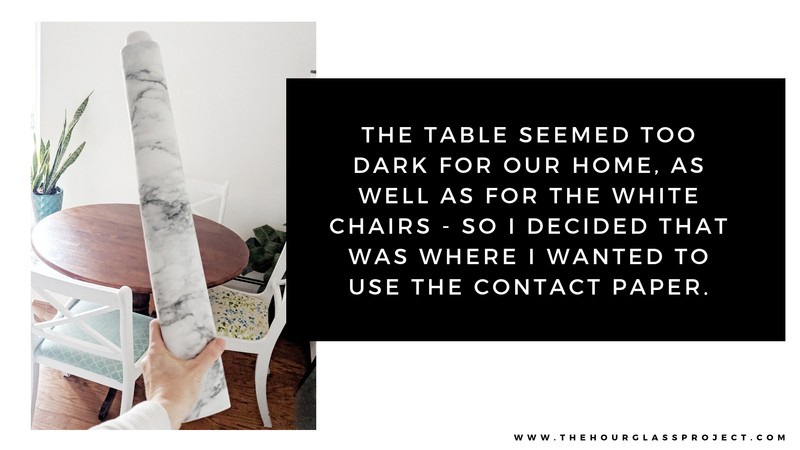 The table seemed too dark for our home, as well as for the white chairs – so I decided that was where I wanted to use the contact paper. I polled the family and everyone seemed on board, but I wasn’t quite sure how I was going to pull it off. After a quick search on the good old internet I saw some tips and tricks and decided, what the heck, it would only be a $6 error if I messed up. So I went to work. Before I began the project I cleaned and dried the table so that the adhesive would stick properly. I did not want any dirt to come back to haunt me. 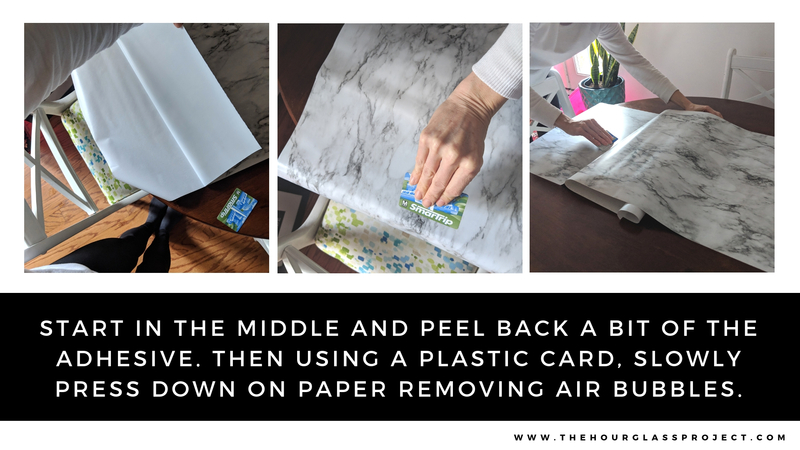 The table was larger than the contact paper, so the first step was to cut the contact paper into sections to cover the table – for me it was three strips. I then started in the middle and peeled back just a bit of the paper backing revealing the sticky adhesive. I left enough paper to hang over the edge and placed the sticky side down onto the table. I used a plastic card (my metro card, but any credit card or gift card would work) to smooth down the paper and remove any air pockets. I continued to do this until the entire sheet was adhered to the table. I then sat in front of the edge of the table where it was rounded. I removed the adhesive and using a tip I found online, used my blowdryer on low to heat up the paper creating a little bit of a stretch. I gently pulled the paper over the edge and tucked it under the table. I continued this process slowly until I had finished the entire section of contact paper. I could not believe how perfect the finish was. It totally molded to the curved edge. I then went and smoothed down the contact paper on the underside of the table. This part is a little less than perfect and I could have benefited from using less paper – or trimming it – but no one will see it, so no harm, no foul. I used the blow dryer to make sure the paper adhered to the underside and that it was staying put. I then completed the other side in the same manner. The next phase was a bit harder because I had to line up the seams. I was able to find the match in the pattern and I lined them up perfectly. I pulled back a bit of the paper to expose the adhesive and I placed it down and lined the two edges up. There was a lot of trial and error during this process, but the adhesive is forgiving and allowed me to try and try again (and again and again). At one point I used the blow dryer to try and stretch the material to fit better – I do not recommend doing this. It didn’t really work and it made the process go slower. I started at the far end and and traveled from left to right, but when I did the third portion I started in the middle of the table and came outward towards the end of the table which worked lot better. Once the table was covered I followed the same method as described above (with the hairdryer) to do the edges. On the second side I totally forgot to match the material before I cut the excess, so it left me with a mismatched pattern. Oh well – at least faux marbles forgiving, right? When all was said and done the table was far from perfect. Using the blowdryer in the middle to try and join the seams worked against me pulling extra material and causing slight overlaps. I worked on pressing these down and minimizing them as much as possible, but I had to move past the idea that the table would be perfect. I also had areas where there was a slight gap between the seams (we are talking millimeters, but I could definitely notice). Again, I had to just accept that it wouldn’t be perfect – which was a great learning lesson and tool as my eight year old daughter was helping me with the task. Once the table was done I had an idea to add some paint to the gaps in the seam and to add some faux marbling as well to the side where I forgot to line up the patterns. It worked and finished the table off well. The paint does change the surface texture of the table in the areas I added the paint, but I’m okay with that because you only notice when the light hits it just right. I may eventually redo the table with the tips I’ve now learned, but only if the current contact paper gets used and abused. I’d try to better match up the print so that it lines up continuously. I did this on one side, but not the other. 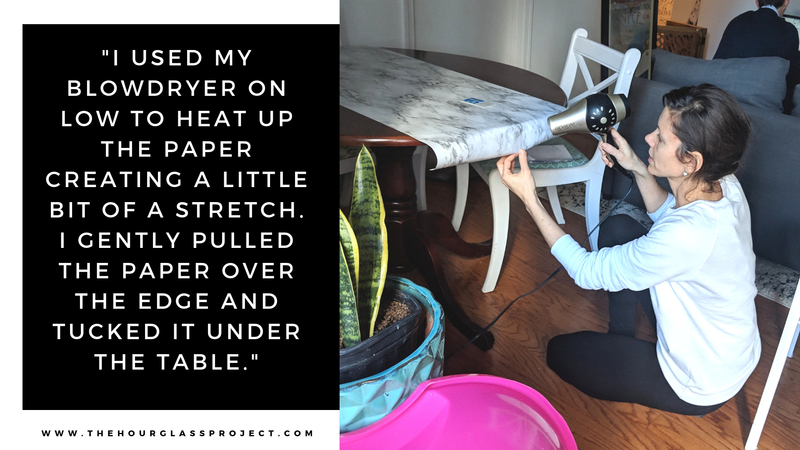 I would not blow dry the top at all – this messed me up a bit when trying to line up the seams. I would worry less about perfection knowing that I could add a little paint to smooth things over. Overall I am thrilled with the table. I think it takes our dining area up a notch and it certainly lightens up our home. What do you think? 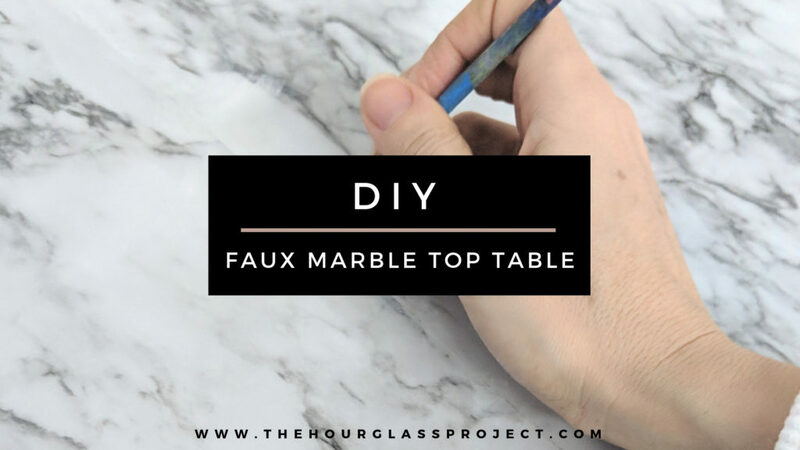 Have you ever used faux marble contact paper? If so, tell me about it! I’d love to hear!